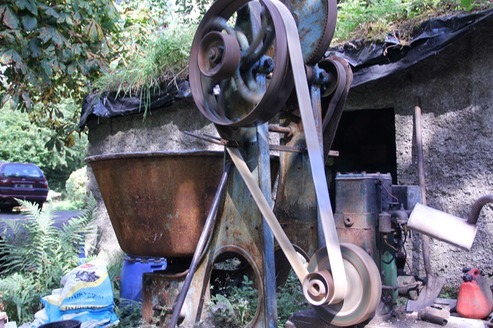 I know many of you who have visited the pottery have been fascinated by the old piece of machinery just outside our pottery shop which is still used once a year to mix our clay. I’d like to give a bit of background to clay mixing and why we do it!! In an ideal world potters would go out to their clay pit, dig their clay and make pots in their workshop without any hassles. Some potters are lucky enough to to able to do this but as no good clay is being mined in County Cork we had two options. One was to buy in ready mixed clay which is more expensive and quite variable in quality or to buy powdered clay and mix it ourselves. 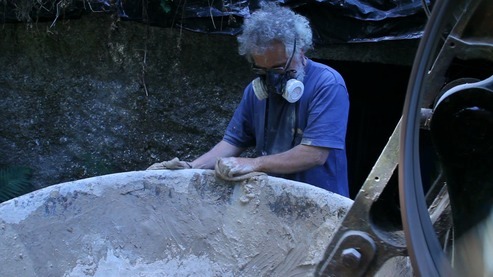 The benefits of buying powdered are lower costs as dry clay is lighter to transport but more important is the control we would have over the quality and type of clay we could use to make our pottery. We have always used powdered clays from Devon and Cornwall in the UK. Industry uses clay for many processes. Clay is mined and blended and dried and sold in 25 kg bags. Unfortunately the drying process destroys the one quality potters really need for a good ‘throwing clay’ which is referred to as plasticity. It’s possible to get round this problem by adding water back to powdered clay but time is needed to bring clay that has been reconstituted back to a good plastic clay. In the early days of Coolavokig Pottery, late 1970’s, we used to make a very liquid mix of clay in barrels then place it in trays to dry. While this is definitely the best way to get maximum plasticity. The wet climate of Ireland and the space needed for drying trays was impractical. So after a year or so we opted for the second best option which is to use a ‘dough mixer’ as a clay mixer. Fortunately another potter had an old dough mixer for sale. This originally belonged to a bakery in Skibbereen. It was transported in the back of an old Landrover and was put in place where it resides today. This is a really old machine made of very heavy cast iron which is probably over 100 years old, so we hope we never have to move it again!! To work the clay mixer we have a Lister motor powered by petrol/ gasoline that drives the mixer by a flat belt as you can see in the video. This motor is quite temperamental but over the years and with the help of a neighbour with good mechanical skills we have kept it going. We use to two types of powdered ball clays. One has more iron oxide present to give the clay body some colour and we mix in a silica sand to reduce clay shrinkage. The sand ratio is about 20% of the total mix. It is mined in Drogedha north of Dublin. Fortunately this sand is also used by greyhound race tracks in Limerick and Tralee so we can often get it nearer to home. The sand has to be dried and sieved before use to get rid of any impurities. We normally mix clay in the Summer months as it is a more pleasant job if the sun is shining! We normally mix 50 to 60 bags at a time. This can take about 3 or 4 days depending on Lister motor breakdowns and other problems. One mix takes about 1 hour. 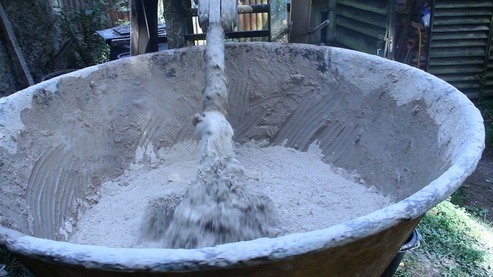 The two types of clays are put into the mixer and blended with the sand for at least 20 minutes. This is a dry mix. After 20 minutes water is added along with recycled liquid slip (liquid clay) from the workshop. Getting the right amount of water is a little tricky but it is always better to have the mix slightly too wet than a dry mix. A mix that is too dry will not develop the plasticity needed for good throwing clay. After 35 minutes or so of ‘wet mixing’ the clay is ready to be put in plastic bags for storage (old fertilzer bags got from a neighbouring farmer are used). This is where the magic happens. The clay still is not ready to be used but must ‘age’, the longer the better, preferably for 1 year or longer. A biological reaction starts once the water is added that over time brings the clay back to its original plastic state (this can be speeded up by adding vinegar to the mix). We normally mix our clay at least a year in advance to allow us to have plenty of mature clay. We keep a note of how much clay we use over a year and always mix a little extra just in case we need a bit more.